Welcome to our beginning reading and writing program! This program is free of charge and complete on this web site. Products offered are enriching and helpfull, but not essential. The site is for moms and dads, teachers and assistants, and all others who want to set a child to reading, to writing, and, yes, to Phonics Too®! NEW! Reading and Writing from Abc to Xyz: an Illustrated Handbooks for Moms and Dads follows a twenty year tradition of works designed to help parents, teaching assistants, and teachers secure the literacy dream that “Every child should have the right to become an effective and enthusiastic reader and writer.” Under the Phonics Too® title, the multimedia version appeared in 2003. In 2004, Trafford Publishing and Phonics Too® published the book: Reading, Writing, and Phonics Too®: A Beginning Literacy Program. The 2004 book may be purchased from leading book sellers including Amazon. 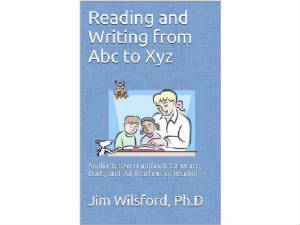 Now in 2016, Reading and Writing from Abc to Xyz brings these proven strategies to moms and dads (and perhaps others) in an illustrated and easy to use format. The Kindle version has allowed the inclusion of features impossible in previous efforts. The version offers over 250 full color illustrations, including all the student lessons. The digital nature of Kindle has allowed us to include over 30 internet links to many of the poems and stories used in the student lessons. The coaching directions for parents have been edited for clarity and ease of use. Editing the instructional information with parents in mind and separating it from the student lessons, has made this an easy to use book. Click on the name of the page that you wish to retrieve! 1. Coaches' Manual: How to! Would you like to purchase the Kindle book version of this program? Would you like to enhance this web program with an audio CD of the 76 poems and stories in the program? Click to hear this Poem. Order Jim Wilsford's new Kindle Book: A School Just Like This. This book is Jim's story as Principal of Aynor High School, 1970-1972 (Click Here).